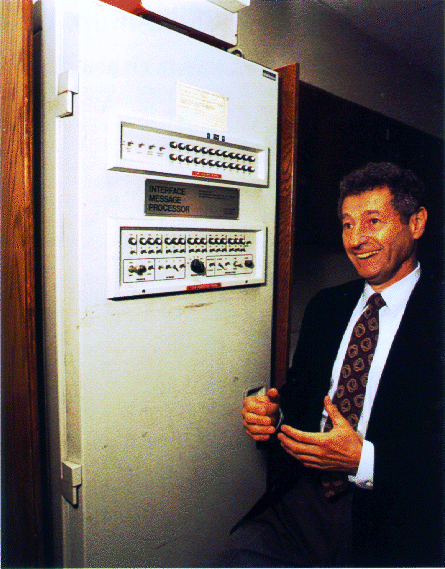 Len Kleinrock and the first Interface Message Processor. "There are 12 major technologies integrated within the iPod, iPhone and iPad that stand out as features that are either 'enablers', or that differentiate these products from their rivals in the market. These include semiconductor devices such as (1) microprocessors or central processing units (CPU); (2) dynamic random-access memory (DRAM); as well as (3) micro hard drive storage or hard drive disks (HDD); (4) liquid-crystal displays (LCDs); (5) lithium-polymer (Li-pol) and lithium-ion (Li-ion) batteries; (6) digital signal processing (DSP), based on the advancement in fast Fourier transform (FIT) algorithms; (7) the Internet; (8) the Hypertext Transfer Protocol (HTTP) and Hypertext Markup Language (HTML); (9) and cellular technology and networks -- all of which can be considered as the core enabler technologies for products such as the iPod, iPhone and iPad. On the other hand, (10) global positioning systems (GPS), (11) click-wheel navigation and multi-touch screens, (12) and artificial intelligence with a voice-user interface program (a.k.a. Apple's SIRI) are innovative features that have drastically impacted consumer expectations and user experiences, further enhancing the popularity and success of these products. [All emerged directly or indirectly from government funded research efforts]."